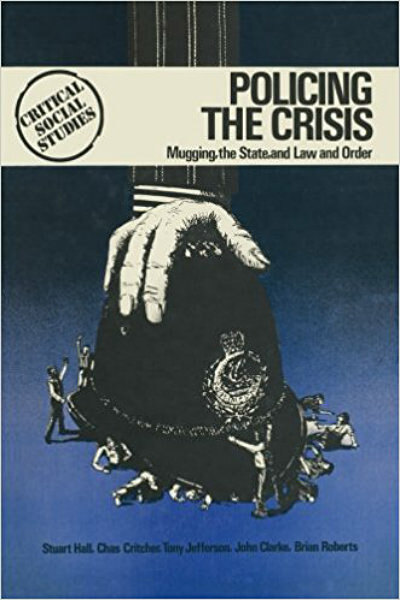 Stuart Hall et al's Policing the Crisis: Mugging, the State, and Law and Order, changed my life. In my brief stint of thinking perhaps I might enjoy studying sociology, I didn't retain much, but this seminal text has been one I have referred to since and I am forever grateful for my introduction to it. To summarise: following increased Afro-Caribbean immigration into the UK, newspaper headlines, police and politicians started screaming about a 'mugging' epidemic in the early 1970s — a crime which had long existed but which, through this sinister title, sounded brand new because it could be attached to an ethnic minority. Citizens became fearful because their internalised racism made them susceptible to this manufactured moral panic. When politicians seized on this fear as a way to install oppressive state mechanisms such as surveillance and increased police powers while avoiding tackling real social crises such as poverty and health, the general public were thankful and compliant. In short: using racism to win votes while ensuring the public are under control is a tried and true method. And so, every time I hear about this 'African gang' crisis we apparently have in Melbourne, my mind goes back to Hall's text. Why is the media whipping up racialised fear? Will the major parties again take 'tough on crime' policies into the upcoming state election? How can the allegedly most progressive city in the country continue to be so incredibly gullible? Through last week's Sunday Night report on Channel 7, we were treated to another round of fear mongering. Never mind that just last year police admitted that the so-called 'Apex Gang' did not exist and had never been predominantly African. Never mind that crime rates have in reality been falling across the city. The true tragedy of this is that thanks to continued sensationalised coverage, citizens are now policing their non-white neighbours at escalating rates and racially-targeted crimes have increased. As an Aboriginal woman, I'm awfully tired of being told by politicians and newspapers which other people of colour I'm supposed to scared of. Particularly since all of these groups have thus far managed to come here and not undertake massive genocidal programmes such as massacres and stealing kids. Not only is it grubby vote grabbing on behalf of politicians and the apparatuses which support them, but it reminds me of how deeply embedded the White Australia Policy is in the psyche of this country. Yet it keeps happening. In the 1990s, Pauline Hanson was telling us we were being 'swamped by Asians' and people were terrified that the country would be overrun. In the 1950s and 60s, post-war immigrants such as Italians and Greeks were the objects of fear. People scurried off to the suburbs to be safe from the 'new Australians' who were apparently stealing jobs when they weren't too busy getting around in gangs. "Each wave of immigration has brought a new opportunity for demonisation. Meanwhile, actual fascists are now operating out of club rooms in suburban Melbourne." Thanks to 9/11 and the media's ability to capitalise on societal fears of terrorist attacks, we ended up with diminished rights to protest, the ability for the police to hold people without charge for extended periods and certain groups of people being named in anti-terrorism legislation. It's now standard for special operations police to be stationed at rallies armed to the hilt with assault weaponry and hardly anyone questions the necessity of this. People are so scared of boats that federal political leaders have been able to use this fear in bids to win elections. The continued waves of panics have led to the shutting down of major train stations to disarm a pair of shoes. It's so ingrained that when a news report tells me that they're unsure if an incident is 'terrorism related', I know that the perpetrator is usually a brown man who's potentially also a Muslim because when it's a white man, they focus on his 'mental health issues'. Each wave of immigration has brought a new opportunity for demonisation. Meanwhile, actual fascists are now operating out of club rooms in suburban Melbourne and not only are they continually portrayed as just having a different opinion but police facilitate their marches through the CBD. The papers and politicians are not telling us to be afraid of white men who are radicalising. Why? Because people believe that white men belong in Australia and their individual crimes are therefore not seen as being a collective cause for fear. Even if they are stating that classrooms should be stocked with Mein Kampf. Instead, these men are allowed to conduct their hate rallies while African migrants are hassled and arrested by police, merely for being nearby. Regardless of what Peter Dutton says, I regularly go out to eat dinner. Sometimes even to African restaurants. The biggest threat to my livelihood and that of my extended family appears to be continued governmental policies designed to oppress us such as the NT Intervention and the Community Development Programme. Or it's our exorbitant imprisonment rates because we also know a thing or two about being criminalised simply for being black in this country. Or it's domestic and family violence which continues to claim the lives of women at the tune of more than one per week. It's not fabricated gangs of African people nor is it any other racially marginalised group being demonised for votes and increased social control. Perhaps it's about time Australia took stock and heeded Hall's words. Because while another racial minority gets vilified by the press and the politicians under the latest iteration of 'mugging', the rest of us end up being played for mugs. Thank you for your measured presentation of the facts concerning this issue. I was dismayed yesterday to hear the Prime Minister himself now take up language that singles out members of a particular racial background as responsible for a particular set of crimes when colour and race labels are not applied to more established majority groups similarly represented in other forms of crimes. Watching the AFL last weekend, it was clear the commentators were respectfully avoiding using racial labels, despite the two stand-out stars of the game – one from each team - sharing the same racial background. I can only assume this is AFL policy and I applaud it. It recognizes the inherent social risks of racial labeling, even though at times, opportunities to celebrate a sporting community’s achievements must be sacrificed. Similar leadership has been demonstrated within certain sections of Victorian police as they employ social liaison initiatives and targeted recruitment policies. Their objectives are clearly pragmatic, however they’re based on the understanding that the use of racial labels panders to community ignorance, misunderstanding and prejudice, entrenching poverty, marginalization and all their trappings. If only strong leadership like this was as prevalent and outspoken within our current government. Fantastic article and compulsory reading for all Australians. It's a pitty it's not on the front page of the Age. Being played for a mug isn't one which sits with me nor my Kenyan neighbours. Yes. Simply yes. Just how can we reach the numbed out masses? As a child growing up in the 50's and 60's, I lived in the Riverina town of Griffith. There was a huge influx of Italians following the end of World war 11. "Ities" or "Dagoes" as they were called . were credited with being members all sorts of gangs of youth in the town , not to mention the Mafia. We 'whites ( Angelo Irish) were warned by our parents to keep away from them. They were often the subject of bullying by white kids at school. Sure, as history tells us there was a very small criminal element in the town, connected with illegal growing of marijuana - I went to school with some of them in Primary , but to label a whole ethnic community was way over the top. Sadly the tactic of labelling minority ethic communities is not new. The Vietnamese community copped a beating in Southwest Sydney in the 1980's . I am not surprised the Sudanese community in Melbourne is copping it now. I may be wrong and stand corrected but here in Canberra we don't seem to experience a high level of racial intolerance compared to the major cities. Could it be that we are better educated and accommodating ? You are absolutely spot on Celeste. I completely agree with you Jane. It might be Gavin that the lack of racial intolerance in Canberra bears no relationship at all to your level of education or acceptance of others but reflects the low levels of multiculturalism and poverty compared with the big cities on the coast which take the majority of immigrants. Each wave was met with the same hatred, same words, same demonisation. The only thing that changed was the nationally. Each wave melted quickly into Australian society. In doing so, our culture over time evolved into what we have today. In fact, John Frawley, the real Canberra where real people actually live has been noted for its happy multiculturalism for years. Hi John We have a very high level of multicultural groups in this town. The multicultural Festival bears that out . AND surprise of surprise ( as an ex ABS person I can comment ) quite a high level of poverty (relatively speaking) . The cost of living here is very high as we have large numbers of senior public servants here. I still think education is the key to tolerance . I totally agree with everything you say. It was largely perpetuated by Rupert Murdoch across his media. Unfortunately now DT is President of USA people feel it is perfectly fine to let loose on their thoughts and biases. A few years ago while we still lived in Melbourne there was a huge outcry regarding people from India. A lot of this was because the Media would specify that the victim or sometimes the aggressor was Indian. Quite frankly who cares....aren’t we all just human beings? We moved back to NZ after living in Australia for 24years Sadly my husband feels racism here is too hidden, he feels better able to deal with it in the open as it is in Australia. Yes it is natural to feel scared of the unknown however once we all reach out to get to know one another we find out the truth behind the media BS. “since all of these groups have thus far managed to come here and not undertake massive genocidal programmes such as massacres and stealing kids” That was the stand out line in this article for me. How ironic that the group everyone should fear due to its history of violence toward others the world over - white men, are the ones demonising and fear mongering! I wonder whether it's 'people of colour' specifically who are made to bear the brunt of fear and resentment in the community? History seems to show that it's the poor, whatever their colour, whose existence frightens governments into fascist attitudes and behaviour. The more people there are who have good reason for resentment and little hope for change, the more people fear them. The French Revolution frightened the upper classes all over Europe for a hundred years at least. One response was to try to change the system to one which promotes justice and equity. Another was to stir up fear and division among the poor themselves, to undermine their solidarity and 'revolutionary potential'. It's not colour that the problem. It's class, including the widening gaps in education, respect and access to resources. Thank you for this article. The latest round of race baiting has made me feel sick. May I suggest that both John Frawley and Gavin have valid points to make. Change often provokes anxiety. Where that anxiety leads depends on the real or perceived impact on one's own situation and on one's ability to cope. Personal security and self-confidence can assist in coping. Insecurity can provoke adverse reactions. The east-coast capitals, and Sydney in particular, have born the brunt of numbers especially, I suspect, of the less-skilled immigrants. Canberra may be 'multicultural' but it has, again I suspect, a migration component that is more integrated into the host society. This is not to say that we cannot incorporate a large inflow of immigrants from other cultures. We did it well in the post war years but then we called them 'New Australians' and not 'Sudanese Gangs'. We actually tried to make it work by helping immigrants to adapt and encouraging them to become citizens and fostering a welcoming attitude among the receiving society. The Good Neighbour Council and the community activity that it spawned was instrumental, I suspect, in facilitating acceptance. It wasn't without problems, of course, and migrants would cop the 'Wingeing poms' and' Mediterranean backs' slurs and Arthur Calwell could still assert that 'two Wongs don't make a white', but back then we at least tried to make it work and from that investment we have reaped the rewards many times over. Contrast that with the present government which tries to make the immigrants life as difficult as possible.